﻿The BetOnline racebook mainly focuses on USA and Canadian horse racing. 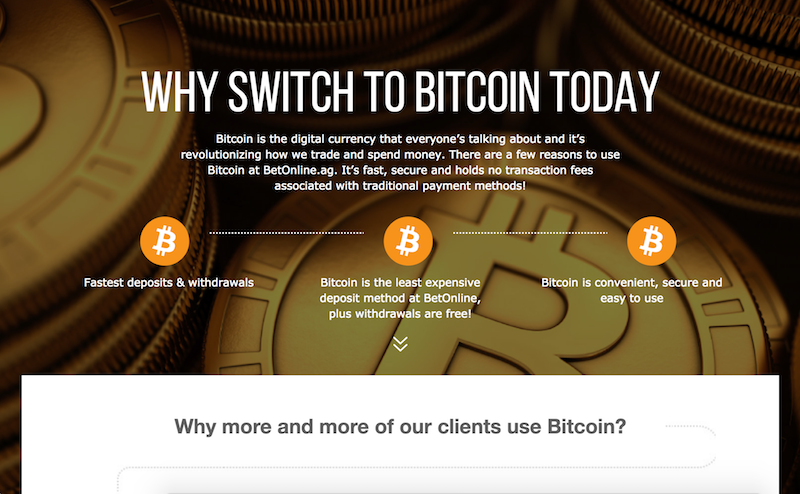 You can deposit or withdraw with Bitcoin, Dash, Ethereum, Dash and Litecoin. Wager on thoroughbred and harness horse racing from any iPhone or Android. Place Straight, Exacta, Trifecta, Superfecta and Daily Double bets on horse races. BetOnline offer a risk free $25 horse racing bet where they will refund a losing bet. Crypto deposits/withdrawals are free. Withdrawals a processed within 1 day. BetOnline offers a generous 7% rebate on your horse racing wagers. Detailed racecards available that provide a wide range of information on each race. This trusted and well known online gambling platform is one of the few to offer comprehensive options for those looking to use cryptocurrency to bet on horse races. They offer accounts globally, placing no restrictions on the user’s country of origin. This is great news for United States residents, as they are barred from participating in many online gambling platforms for legal concerns. This platform does require some identity verification in order to make a withdrawal of your winnings, however they are quite reasonable. You’ll simply need to supply a picture of your photo ID card and a photo of a utility bill. The first thing you’ll likely notice here is the wide variety of race options available. You’ll quickly be able to choose a racing location on the left from either the United States or Canada. After that, you can narrow it down to exact locations and evaluate the race information. Pretty much everything you’d want to know is on display here including the names of the horses and riders, the size of the purse, the track’s distance and even the surface the horses will be running on. For a novice this all may seem uninteresting, but for more advanced players it’s very convenient to have all of this information in one place to help you make your picks. You’ll be able to choose between 23 US tracks and 2 Canadian tracks. This includes popular locations such as Belmont Park, Churchill Downs, Keeneland and Santa Anita Park. With the wide variety of locations available it should be easy to find something that suits your fancy. We talked earlier about the sheer number of options you have when betting on horses. That’s true here as well, but they actually make it quite easy to understand. 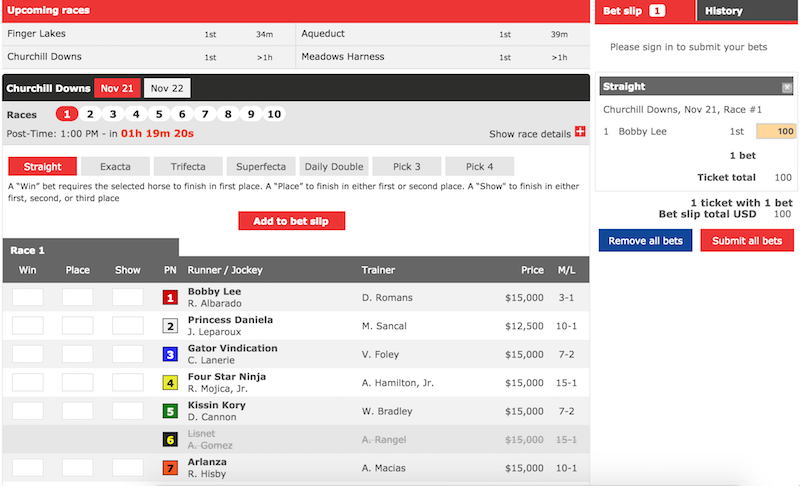 You don’t really need any specialized knowledge to bet on horses using their system, and the platform’s interface makes it a breeze to place your bets. You can choose a “straight”, which means you’ll be looking to pick just the winner. This is of course the most straight forward betting option that everyone knows. Pick the winning horse and walk away a happy and slightly richer man. However, if you’re not so confident in your ability to choose a winner then you can even up your odds a bit using some alternative betting types. You can do this by choosing “place” or “show”, and if your horse finishes within the first three spots you’ll still win money. After you’ve gotten a little more experienced with the game and have done your research on the competitors, you may want to up the ante a bit. If that’s the case then you can explore one of the many other interesting betting options available to you that make the game that much more exciting and typically up the size of your win as well! Here’s a look at all of the betting types they have and what they mean. The easiest way to go. This is your basic bet, and you can choose to either pick the winner or to pick a horse which finishes somewhere in the top three to still earn yourself some coin. A little more risky, but if you choose this option you can win big if you can pick the first and second place finishers. The catch is that you have to be able to say what order they will finish in as well. That makes this a tougher play than our first option. Similar to the second entry on our list, you’ll need to pick the top three horses in the order they finish. A tough bet to be sure but also a very rewarding one if you can pull it off. Pick the first four finishers in the correct order, just like the other two options. Really like pushing your luck? With this betting option you have to be able to pick the winning horse from two consecutive races! An exciting option but probably not a great choice for those who are new to the sport. Save this one for when you get a little more experience. For this option you’ll need to pick the winner for a consecutive number of races. You can choose between three, four, five or six races in a row. The platform also offers some very nice bonuses that you’ll want to know about. It’s no secret that most online gambling platforms offer some type of freebie in order to entice would be gamblers into choosing their platform. That’s of course the case here as well, but they also have some other cool tricks up their sleeve you’ll want to know about. Let’s get in to what you can expect here. This site actually has a lot of bonuses available, and it can be easy to miss some if you don’t look around. Keep in mind that all of the information is not displayed in the horse betting section, but some of it does still apply to you even if you don’t have an interest in betting on other sports. This platform has some of the most generous promotions you’re going to find, and you should make sure that you take advantage of all of them. There are actually even more than what is listed, but some of them only provide bonuses for the Sportsbook. If you’d like to place some bets there as well though, then make sure to check out everything they’ve go. They have one you can use for life to get 25% of all future deposits back as a free wager for the Sportsbook if you’re interested in trying that out as well. The first bonus you’re going to want to look at is the cryptocurrency deposit bonus. While this one is listed in the regular sports betting sections it should still apply to horse race wagers, because the bonus happens before even placing a bet. Using cryptocurrency is cheaper for the operator than using fiat methods. That means they typically offer generous bonuses to get you to use it. 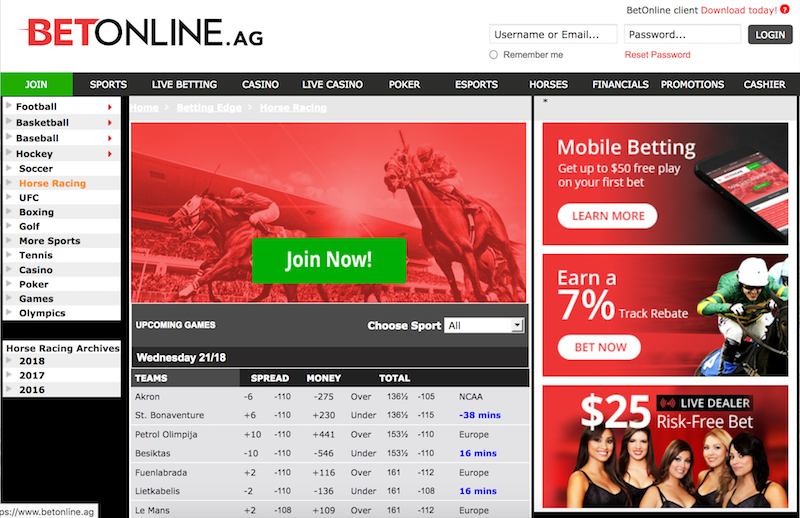 That’s good news for you, and BetOnline offers a whopping 50% bonus on their approved currencies. That includes BTC, BCH, LTC, DASH and ETH. Keep in mind that this only applies to your first deposit, and you will need a promo code available on the promotions page to use this one. It’s a great bonus though, so don’t miss out by forgetting to use it! They’ll match any deposit from $20 up to $500 on your first go. ​Not real sure about your prowess as a horse race gambler? Well, your trial run is free when using this service. BetOnline actually offers a totally free wager for new users up to $25. However, it works more like a refund. You can place a bet up to their $25 limit, and if it doesn’t win, then you’ll be reimbursed with another free $25 play to try again. It’s more of a credit, but if you plan to spend the money anyway, then it’s like a free do over while you’re learning the ropes. Interested in placing your bets on the go? Then you can score another promotional bonus by using their mobile site or application. This one allows you to get up to a $50 bonus on your first bet. Do you have some buddies who are into sports too? Of course you do! Send a referral link their way, and you’ll be able to earn 200% of their first deposit. This is capped at $200 per referral, but they also have a leaderboard. If you have a lot of friends who are into horse racing and sports betting then you could take home their $10,000 cash prize on top of your referrals. Plus, they give you $20 just for getting the referral! One of the cool things about horse races is that many of the platforms offer you rebates. If you are not yet familiar with the sport, a rebate is basically a refund on your bet if you don’t win. The sting of loss is mitigated ever so slightly by this small kick back, and you’re free to put it on another horse and try your luck again. 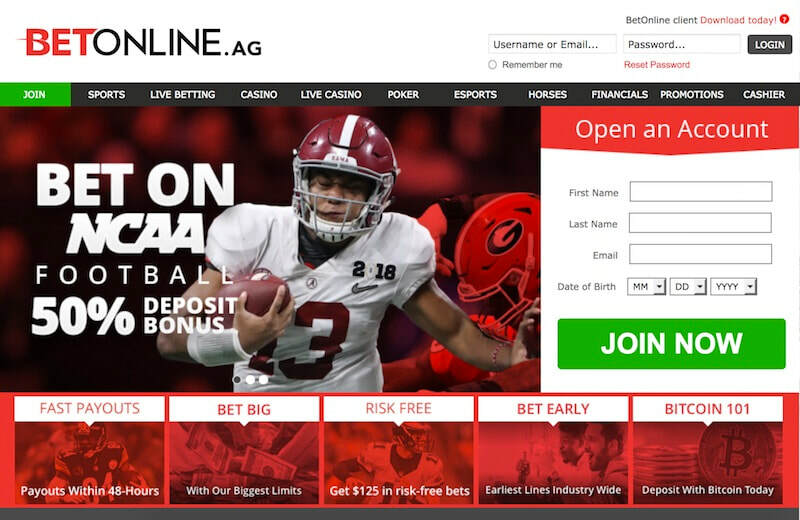 BetOnline offers a generous 7% rebate on your wagers. There’s actually no limit to the amount you can earn using this rebate either. You’ll just get a straight 7% of your money returned to you on losses, and there’s no minimum bet needed to qualify as well. It’s a pretty sweet deal that you won’t get with most other sports betting options. Interested in placing some wagers on the go? The mobile site works pretty well, and there’s no need to take up space on your phone with yet another app. You’ll be able to see your matches at a glance and be able to place new wagers on the go. You’ll also be able to take advantage of their sweet mobile promotion to get a free $50 play, so it might be worth it just for that even if you don’t plan to use it very much. 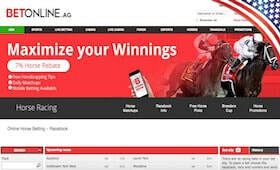 BetOnline.ag has outstanding betting options for horse racing enthusiasts. They offer some of the most generous bonuses in the world of online gambling, and they are friendly to pretty much every country. It’s a great place to participate in not only horse betting, but also a variety of other sports. This is especially true for Americans who may have trouble finding gambling platforms willing to accept them.